I may have to go and completely erase that old blog from existence - it would not be a great creative loss. (Although it did herald the first public appearance of the Hideous Carpet.) Eh, maybe I'll keep it around. It serves to remind me of what a dark place I was in, and how much better my world is now. Plus, my neighborhood (like much of the DC area) was blanketed in bizarrely dense fog when I got up. My street looked like the set from a John Carpenter movie. I was waiting for the homicidal pirates and Adrienne Barbeau to show up. And, apparently, we get even more fog tomorrow! Yee-haw! 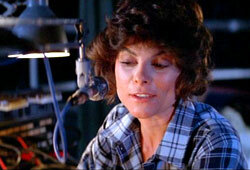 This was the only picture of Adrienne Barbeau I could find from "The Fog" (which was an awful, awful movie.) She was a DJ in some podunk coastal town before the fog rolled in and the evil hook-y homicidal pirate zombie/ghost/whatevers showed up on the scene. This does remind me - I'll be on the radio again next Friday, January 20th. I'll post a note about that next week. I'm still feeling a bit under the weather, and I'm annoyed that I'm not feeling more perky and creative. Sorry to say, you guys lose out to a hot shower, the sofa, and whatever I just got from Netflix. If anyone has any good suggestions for returning my perk to its rightful place, let me know. I hate being a bland lump. I dunno, Merujo. You still seem to be posting more than me, and I have no excuse. I hope you're feeling better.